Clockwise from Top Left: Lexus Club, Soldiers & Sailors Memorial Hall & Museum, The Mattress Factory, Stage AE, Engine House 25. The Mattress Factory: Any company could enjoy this interesting and industrial space for either a sit-down or a blast of a cocktail party. It’s combination of contemporary art and flexible rental spaces make this a very unique gem on Pittsburgh’s North Side. The Lexus Club: Whether a hockey fan or not, you’d be hard-pressed not to enjoy this classy venue inside of Pittsburgh’s Consol Energy Center. With enough space to host over 250 people for a sit-down meal, or 400 for cocktails and hors d’oeuvres, you have many options in this space. Overlooking downtown and with the facility’s Aramark catering staff at your beck-and-call, this is a pretty fabulous place to reflect on 2012’s victories! 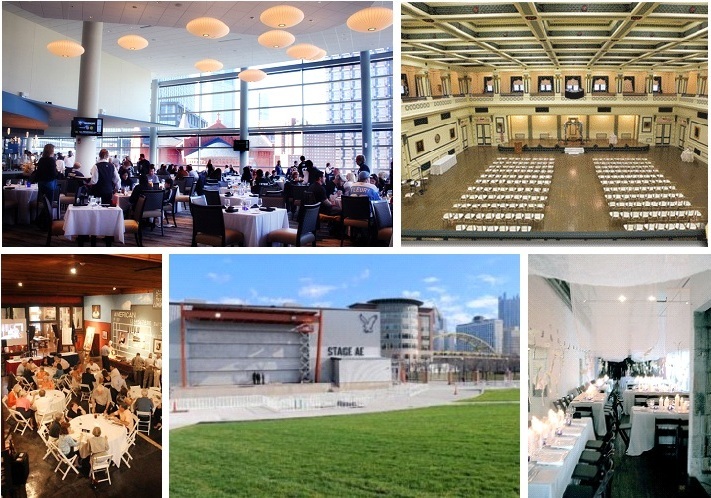 Stage AE: As Pittsburgh’s newest concert and event venue, Stage AE has hit the North Shore by storm by bringing not only a four seasons entertainment venue to the area, but one that provides numerous options for a variety of hip and urban event styles. With its minimalistic interior space, it can accommodate between 400-1500 easily in a multitude of configurations. It’s also a great place to book a band for your after-dinner entertainment so guests can dance the night away. Engine House 25: Located in the heart of Lawrenceville, and home two event spaces, an operational winery and wine cellar as well as the Clemente Museum, this is one venue that is unlike any other in town. With ample parking and a very unique blend of baseball history, industrial-chic interior design and intimate wine cellar, you have many options when it comes to entertaining your team in this fun location. They can even custom-make wine bottle labels for your event in-house, an added special feature your employees will surely be impressed with! Soldiers & Sailors Memorial Hall & Museum: Providing a “distinctive alternative to conventional venues” in the heart of Oakland, this venue would give your guests both a fine place to party as well as a glimpse back in time to the history of our military. With its newly renovated interior and large ballroom space, this is an ideal location to host a large corporate gathering of any kind. Ideally situated near the University of Pittsburgh and public transportation, your guests will be impressed with your ability to combine convenience, affordability and a first-class space all within one location. 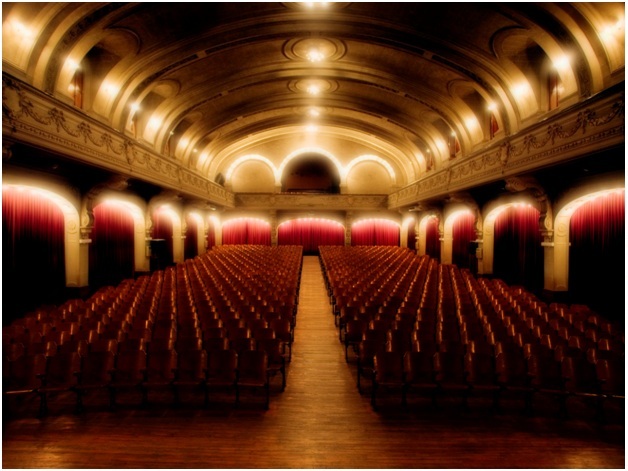 Looking for more venue ideas or help coordinating your company’s upcoming event? Contact Lindsey at lindseyb@helloproductions.com, or message me on Twitter @lbradleypgh today! It’s that time of year again when we’re gearing up to help our clients plan their annual meetings – expertly balancing engaging content, superior venues and high-quality, exciting entertainment for the attendees. As our clients are realizing more and more the value in providing not only a great meeting, full of important content for their employees, but also in providing them with an experience that will help to energize them through the next year and beyond, it is becoming imperative that we find the most creative, cost-effective and fresh entertainment and outing ideas possible to include as part of the overall concept. Treasure Hunt: Get everyone bonding and learning all about the city the meeting is being held in with a distinctive treasure hunt…the winning team could be recognized at the opening dinner. Lunch Cruise: If you live near the water, provide your staff with a fabulous cruise including lunch, musical acts and networking activities…consider adding a private wine or beer tasting by a local winery or brewery to the itinerary if this fits within your budget and corporate culture. Comedy Troupe: An array of acts can be found within the comedy world…consider asking them to do some creative improvisation with ideas from the audience, or impersonations of your top-level executives to get everyone laughing (or laughing at themselves!). Invite the Circus: If you’re kicking off your event in a large auditorium or banquet room, hire stilt walkers, gymnasts, trapeze artists, fire eaters and more to wow your guests and get everyone feeling like a kid again! If your CEO is up for it, ask them to conduct the dinner or opening discussion dressed as the Maestro of the Circus. If this happens in the afternoon or early evening, have cotton candy, Cracker Jack and lemonade vendors circling the crowd. Murder Mystery Dinner: Hire a professional team to perform a murder mystery while your guests enjoy their meal. This will engage your attendees, get them working together and also entertain them. Tradeshow Floor Fun: Since many vendors and attendees have been at their fair share of boring and/or lengthy tradeshows, make yours “pop” with strolling entertainment! Invite a magician to do card tricks, a mentalist to read the minds of attendees, position living statues at strategic points on the floor, and celebrity impersonators to mingle with the crowd. The possibilities are endless, and can be tailored to your specific tradeshow theme. As always, the entertainment and outings created for your guests can and should be tailored to your company’s culture, the message of the overall event and the “look and feel” you’re looking to convey to your employees about the company for the upcoming year. In many cases, the annual meeting is a way for your company to show your appreciation for your employees. If that is the case, keep in mind that you’ll want to balance presentations and executive messages with engaging activities of all types to suit the makeup of your audience. Hello Productions would love to help you create your best annual meeting to-date in 2012! Contact Lindsey Bradley, lindseyb@helloproductions.com, today to learn more about our services and to see what kinds of killer events we have up our sleeves for you! It might seem like this is a no-brainer, but especially in an age when all attendees and companies are looking for ways to cut costs, it is imperative that this is kept in mind when planning an event. It doesn’t make sense for our clients, much less the attendees they hope to attract, to have to come by plane, train AND automobile! While we used to think of an airport hotel, or one located within the immediate vicinity, as a negative, it is becoming more of an asset for our clients if they can just hop on a shuttle to their event property after a long flight. Also, consider the time of year you host your meeting and in what part of the country. If you’re really tight on budget, it can at times make sense for us to look into venues during a time that is considered “non-peak” for an area (think Chicago or New York -snow!- for a February conference, or Miami -hurricane season!- in October.) Just understand that there could be delays or other issues involved for your guests in getting to and from the venue, not to mention the airport, on time or with minimal effort. Have you ever attended a meeting or conference in a desirable city, only to leave feeling that you never actually got to “see” or “feel” the city at all? This can go back to what I referred to in point #1, especially if it is a venue adjacent to an airport. If we are able to secure a metropolitan location for an event, it is in your best interest as the client to showcase, at some point, what a great area you’ve secured and that you thought about your attendees’ needs at the event. This could be done through a simple but chic cocktail party at the hotel’s rooftop bar, or if that’s not possible, perhaps in a beautiful, enclosed ballroom with panoramic views of the surrounding city. Special touches during this event could include featuring locally-brewed beer or spirits, as well as making sure that the staff on-hand is prepared to answer questions about the city’s great landmarks. Just as serving locally-brewed beverages during a cocktail party is a great idea, perhaps you could theme this year’s luncheons to reflect locally-grown or sourced products, as well as traditional local fare? The worst thing for your travel-weary attendees is to feel as if they’ve “seen this before” at other conferences. It will really make your event stand out if you serve a meal consisting of local favorites, while providing your guests with a menu pointing out all of the farm sources for today’s meal. As planners, it is our job to work with the venue to provide your guests with the best experience possible, and food can be a big part of that experience. In our digital age, no matter where you plan to host your event, no doubt your attendees will want to not only see that you’re using the newest technologies, but that they can still adequately access the technology that they need throughout their stay. As we explore venues for our clients, we want to ensure that they are wired for all attendees to have wireless internet access, strong connections (so that attendees aren’t missing and dropping calls, and so you are never interrupted during a presentation), capabilities for all types of presentation formats, and a strong technical staff onsite to assist with your every need throughout the event. And there is nothing worse than not having a back-up (or better yet, a back-up for your back-up!) when it comes to things like wireless mics, projectors or the internet connections. And, most hotels are becoming more negotiable on in-room or meeting room internet access, as this is no longer on the “nice to have” list, but is on the “must have” list for any event or meeting. If you have questions on any of the above, or want to talk to Hello Productions more about your next corporate meeting or event, please contact Lindsey Bradley at lindseyb@helloproductions. We’d love to talk to you about all the ways that we can make your next event extraordinary!